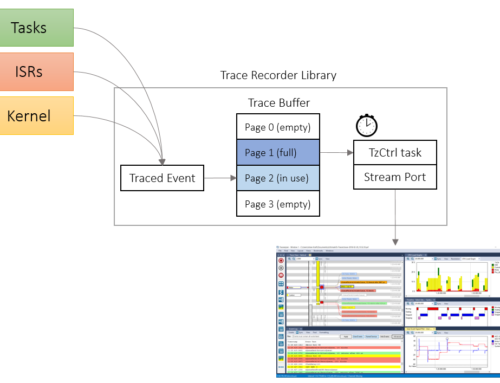 The improved trace recorder library is the biggest change in Tracealyzer v3.1, at least for FreeRTOS, Micrium and SafeRTOS. We have merged snapshot and streaming support into a single recorder module that support both modes, and improved the API and documentation to make it easier to use. If you are using an older version of the trace recorder library, v3.0.9 or earlier, to upgrade to v3.1 we recommend these steps. Remove all earlier recorder files from your project, including the trace configuration header (trcConfig.h etc.) as there are major changes in all files. Also remove the include paths that point to recorder headers. Follow the new integration guide. If using streaming, also follow these steps. Replace any obsolete functions calls, listed in the recorder’s readme.txt. In case you get problems, check the troubleshooting guide. And of course, don’t be shy to contact support@percepio.com if you have any questions!